In a pan, combine gelatin and cold water and let stand 5 minutes to soften. Heat and stir over low heat until gelatin dissolves. Remove from heat and add sugar. Stir until sugar is dissolved completely. Stir in the can of cranberries and chill in refrigerator until partially thickened. Fold in whipped topping. 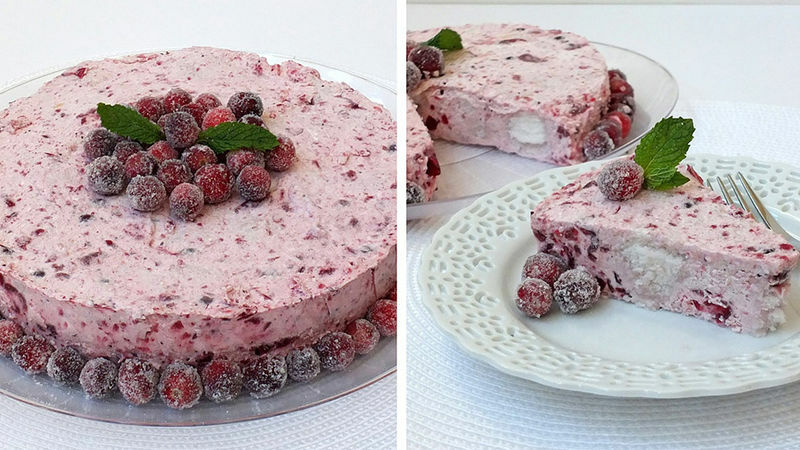 Cut angel food cake into cubes and gently fold cake cubes into cranberry mixture. Pour into a springform pan or a square baking dish. Chill until firm for about 5 hours. Garnish with sugar coated cranberries if desired. To make sugar coated cranberries: Place 2 cups fresh cranberries in a large bowl. Add 2 tablespoons corn syrup and mix until coated. Pour sugar in a shallow dish and roll cranberries in sugar in small batches. Place on parchment paper to dry at room temperature for a few hours or overnight. To remove from springform pan, run a sharp knife around the edge of the pan and release. This is great frozen too! I always have room for dessert. ALWAYS. Even when I eat a heavy meal, I crave something sweet. When a light and refreshing dessert is in order, I make my No-Bake Cranberry Angel Food Cake. It’s perfect for the Fall season, but not heavy like many autumn desserts. Gather up your ingredients: cranberry sauce, angel food cake, unflavored gelatin, whipped topping and sugar. Pour the envelope of unflavored gelatin into a pan filled with 3/4 cup water. Just let it sit there for about 5 minutes or so to soften. Next, heat the pan and stir over low heat until the gelatin dissolves. Take the pan off the stove and add your sugar. Stir until the sugar is dissolved too. Dump in the can of cranberry sauce. I use the kind with whole cranberries —not the log of congealed cranberry sauce. (Although I serve that variety every Thanksgiving, slicing it the way my mom used to). Chill in the fridge until it’s partially thickened, around 20 minutes or so. Take the pan out of the fridge and fold in your thawed whipped topping. Cut the angel food cake into cubes until you have 5 cups worth. You’ll probably have leftover cake. Eat it. It’s low in calories, so no guilt—right? Gently fold your cake cubes into the cranberry mixture. Pour into a springform pan or an 8-inch square baking dish. Chill until firm (about 5 hours) or freeze. If you want to garnish your cake with sugar-coated cranberries, it’s a real pretty presentation and super easy too. Put 2 cups of fresh cranberries in a bowl and add 2 tablespoons of light corn syrup. Stir until all the cranberries are completely coated. Now take a few cranberries and roll them in sugar. Put on parchment paper to dry for a few hours. That’s it! Decorate your cake with the cranberries right before serving. See? So pretty!